It is our view that monetary policy at the Bank of Canada will continue to be constrained by external events in the global economy and household debt growth at home. While the Bank's preference for tighter policy is clear, it is difficult to make a case for higher interest rates when core inflation is below the Bank's 2 per cent target and already slow economic growth is threatened by global uncertainty. Therefore, we are forecasting that the Bank of Canada will hold its target overnight rate at 1 per cent until mid-to-late 2013 when, conditioned on an improved global economic outlook, it may test the water with a 25 basis point rate increase. The government has announced that as of July 9, 2012, new rules will apply to government-backs insured mortgages where the borrower has less than a 20% downpayment. • limit government-insured mortgages to homes prices at less that $1 million. Buyers of homes prices at $1 million or more must have mumimum 20% downpayment. • development or construction or multi-unit bulidings of five units or more, owned by a landlord. Federal Finance Minister Flaherty explained that the reasons for the changes are to "keep the housing market strong, and help ensure households do not become overextended." This explanation doesn't make sense to Cameron Muir, BC Real Estate Association's chief econmist. "Instead of helping make the housing market strong, the new rules will erode the purchasing power of first-time buyers who will be restricted to borrowing less money for their homes." Muir explains the effect of the changes is the equivilant to having a 1% increase in interest rates. This translates into about $50 more on each monthly payment for every $1000,000 of mortgage loan. What this means is new buyers who can afford a home today with a benchmark price of $625,100 will now only be able to afford a home prices at $550,550 under the new rules. This is a potential loss of $74,550 in buying power. "Given that the market is already slowing, the new rules are totally unnecessary," says Muir. What will the new rules cost buyers refinancing a home values at $625,000? • When refinancing at 85%, the home owner can access up to $531,250. • When refinacing at 80%, the home owner can access up to $500,000. What about the new rule limiting mortgage insurance on homes prices a $1 million or more? This is the fourth time in four years that the government has tightened borrowing rules. • In 2008, the government reduced the maximum amortization period to 35 years from 40, required home buyers to have a minimum downpayment of 5% (compate to the previous 0% down), and introduced new loan documentation standards. • In 2010, the government required all borrowers to meet standards for a five-year fixed-rate mortgage, reduced the maximum amount borrowers could refinance to 90% from 95%, and for non-owner-occupied investment properties, requred a minimum 20% down payment. • In January 2011, the government reduced the maximum amortization period for government-backed insured mortgages to 30 years from 35 years and reduced the amount borrowers could refinance to 85% from 90%. What will the new rules cost home buyers? Note: calculations assume a 10% downpayment. 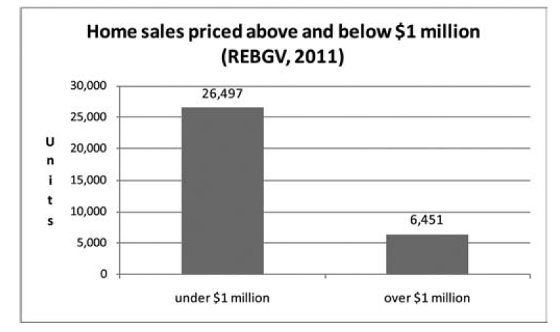 $625,100 is the benchmark price of a home in the REBGV area as of June 1, 2011. The Bank of Canada kept its trend-setting Bank Rate at 1.25 per cent on June 5th, 2012. It was the 14th consecutive policy meeting in which borrowing costs have been left unchanged. While the text accompanying the announcement left the door open to future rate hikes, the language used was considerably less hawkish than in the previous announcement in April as the Bank sounded a cautious tone over the recent deterioration of the situation in Europe. The Bank also noted that while the U.S. economy was continuing to expand, albeit modestly, emerging economies were slowing faster and a bit more broadly than expected. That more modest global momentum combined with heightened financial risk aversion has led to lower commodity prices, which is weighing on Canadian exports. Canadian economic growth was slower than the Bank expected in the first quarter of the year, 1.9 per cent compared to a projected 2.5 per cent; however, underlying economic momentum remains in line with expectations. That said, the composition of growth has become less balanced. Specifically, housing activity has been stronger than the Bank had been expecting, and despite external risks, business and household confidence has remained resilient amid very stimulative domestic financial conditions. In contrast, the contribution to growth from government spending is expected to be quite modest going forward in line with recent federal and provincial budgets. Additionally, the recovery in net exports is likely to remain weak in light of the combination of reduced external demand and ongoing competitiveness challenges, including the persistent strength of the Canadian dollar. The Bank said the Canadian economy continues to operate with a small degree of excess capacity, and that even though headline CPI inflation was expected to fall below 2 per cent in the short term due to lower gasoline prices, the core rate inflation was expected to remain around the target 2 per cent mark. The announcement ended by reiterating that, to the extent that the economic expansion continues and the current excess supply in the economy is gradually absorbed, the possibility of a rate hike was not completely off the table, but that the timing and degree of any such action would depend heavily upon how current heightened downside risks play out in the months ahead. 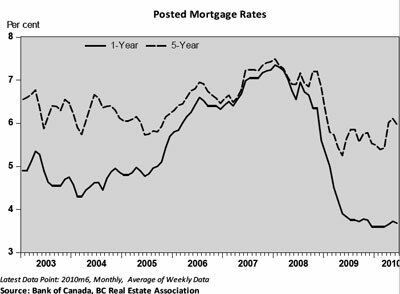 As of June 5th 2012, the advertised five-year lending rate stood at 5.34 per cent. This is down 0.1 percentage points from 5.44 per cent on April 17th, when the Bank made its previous policy interest rate announcement.